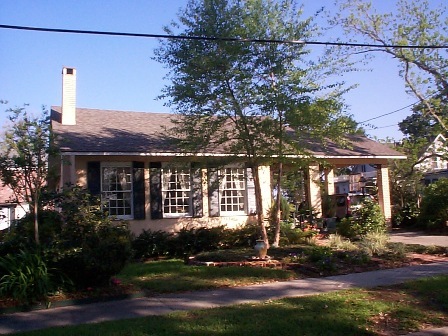 In the 1500 block of Griffith Street, 1518 Griffith, to be exact, located in one of the oldest subdivisions of Lake Charles, Margaret Place, sets a post-card perfect New Orleans style cottage house. This cottage sits on what the original abstracts call Lot 1 of Margaret Manor subdivision which was part of block “C” which lay at the corner of Griffith and what was then called Allen Avenue (now Wilson Street). The abstracts, as well as the daughter of the original owner of the property Harry L. DeWitt, state that Lot 1 was sold to Mr. DeWitt in 1926 by Mr. Paul A. Moss. According to Mr. DeWitt’s daughter Mrs. Jean McGraw Todd, who spoke with the present owners in 2003, Mr. DeWitt resided there from 1926 until 1942. The cost of the lot in 1926 being $7.000.00. Thus, the home itself can be dated circa 1926 or shortly thereafter, according to Mrs. Todd’s recollection. There seems to be a 16 year gap in the abstracts, but according to Mrs. Jean McGraw Todd, daughter of Mr. DeWitt, she and her children lived in the home during World War II when her husband was in the service. Her father, a Mr. McGraw, being the owner at the time. Their memory was of an alley way between Shell Beach drive and Griffith Street which connected the two . One can notice to this day the water meters on Griffith street that still serves a residence on Shell Beach. Griffith Street, then, was a primary location for city utilities, water, gas and garbage pickup. Built in 1919, this two-story bungalow on the corner of Griffith Street and Park Avenue (formerly Line Avenue) was the second home in Margaret Place owned by Dr. H.B. White and his wife, Anna Smith White. The house is built on piers, is constructed of long leaf "heart" pine, and most of the wood siding, tongue-in-grove porch railings, interior flooring, glass-panelled doors, and double-hung windows are original. The first floor boasts 12' ceilings and a fireplace adorned with built-in bookshelves. The exterior has exposed rafters, dormer windows, and a covered wrap-around porch. All of these details are consistent with the bungalow style of architecture popular during the early 1900's and in Margaret Place, particularly. Situated one block from the lake, the house sits on 2½ lots, part of which were once the site of a citrus grove and a strip of land reserved for development as an alley by the City of Lake Charles. The citrus grove was eradicated by an atypical winter freeze and the alley was officially abandoned by the City in 1945. This part of the property eventually became overgrown with pine trees and other native vegetation, resulting in a natural barrier between the house and its adjacent neighbour, the Leon Locke House located at 330 Wilson Street. The original lawn contained a gazebo surrounded by a rose garden, and a free-standing garage which housed the first owners’ automobile -- a Ford Model T.
An inventory prepared by Dr. White after Anna’s death in 1921 states that the house was furnished with four bedroom suites, one dining room suite, one living room suite, and a "library", piano, gramophone, kitchen utensils, and rugs having a total appraised value of $1,800.00. With the exception of changes made to the back porch and sunroom, the original footprint or “bones” of the house remain virtually intact. 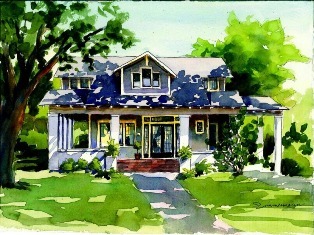 However, as reflected in the photo from 1920 compared with the Sue Zimmerman watercolor, advances in building materials and technology are reflected in changes made to the exterior. The wood siding, originally painted yellow, is now gray; the original asphalt roof shingles (which were later replaced with asbestos shingles), are now modern “lifetime” composite shingles; and the fabric awnings, which covered the porches and many of the windows (and which were later replaced with metal awnings), have been removed entirely now that energy-efficient central air conditioning units have been installed. Over time, numerous changes have been made to the interior of the house, reflecting various owners’ concepts of “modernization” as well as “historic preservation”. In the 1930’s, a local plumber named George Webb installed the area’s first gas central-heating system in what had been the house’s root cellar, and central air conditioning and heating was later installed throughout the house. The kitchen and master bedroom and bath have been updated, most of the shiplap and plaster walls have been covered with sheetrock, and the original wood flooring -- much of which was covered with wall-to-wall shag carpeting in the 1960’s -- and the original craftsman-style stained window and door trim – much of which had been painted -- have been restored to their original state. But one of the most exquisite elements of the home –Italian Carrara marble countertops – is neither original nor new. These countertops are fashioned from sheets of marble originally serving as stall dividers in the men’s restroom of the lobby of the Majestic Hotel, another Lake Charles historical structure built in 1906, which dividers were removed from the hotel and sold as salvage when it was demolished in 1965. The house was built by Dr. Henry Bascom (“H.B.”) and Anna White, who were from Abbeville, Louisiana, though they lived in Geydon for a period of time prior to moving to Lake Charles. A second generation graduate of The Vanderbilt University Medical School, Dr. White moved his family to Lake Charles sometime after 1915 and bought the two lots on which the house is now situated on February 28, 1919. According to Dr. White’s youngest son, Dr. Tommy White of Lake Charles, Dr. White’s office was located in the Nagem Building in downtown Lake Charles, less than one mile from their home. Dr. White purchased the ½ lot adjacent to the Leon Locke property in 1924. He and his family (daughter, Dorothy Ann White, and wife, Natalie, and their three sons) lived at 1505 Griffith Street until 1937, when the property was sold to Bonnie Castle Mertz. Mrs. Mertz and her husband, Fay H. Mertz, lived in the house until 1955, when they sold it to George Lock Paret, Jr. and his wife, Beverly Bowers Paret, who raised four children and lived in the house for 37 years. In 1992, after Lock Paret inherited the property across the street (on Shell Beach Drive), he and Beverly sold the house to local architect Ray Fugatt and his wife, Elizabeth. Two years later, the home was sold to Virginia natives, Dr. Bruce Knox and his wife, Leslie Q. Knox. Ms. Knox, a local attorney, continues to live in the house, which was recognized as a Calcasieu Parish Preservation Society Landmark Home in 1987. Just like Dr. White, Ms. Knox’s office is located in the Lake Charles Downtown Historic District, about a mile away.